I have found that if you have particular tastes in food that all you need to do is ask the people at the front desk of your hotel for what is good nearby. However, if you have decided against reservations made from your hotel . . . and plan on just winging it while you are out . . . this is the section for you. 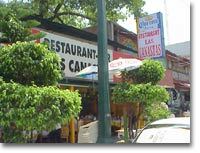 TIP: If you like GOOD Mexican food at reasonable prices, the best advice while in Mexico is to keep an eye out for those restaurants packed with locals. Below you will find a list of places I found while exploring the tourist zone. While It won't tell you where to go for good French food . 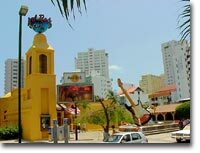 . . it will give you a pretty good idea of what types of restaurants you will find while exploring the Acapulco tourist zone. 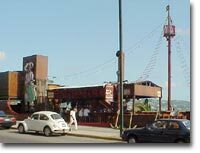 If you are looking for a place to eat or something to do at night, but dancing just isn't your thing, check out the El Sombrero Cantina. 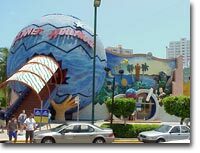 If you are hungry they have good Mexican food between $40.00 MXP and $90.00 MXP, & sea food plates between $65.00 MXP and $210.00 MXP. -- Stop in and give their mechanical bull a try. Costa M. Aleman #111 -- on Playa Condesa. Look for the pirate (& skeletons in cages) next to the bungy tower. Standard Hard Rock Cafe with Rock & Roll memorabilia on the walls & T-shirt shop. They serve hamburgers, ribs, chicken, steak, and basic Mexican dishes for between $60.00 and $160.00 MXP. 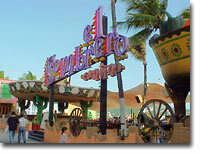 -- The Acapulco nightlife here includes dancing at night around 10:00 with no cover charge. 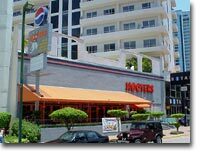 Hooters Acapulco restaurant has sea food, salad, shrimp, sandwiches, burgers, steak, hot dogs & several other dishes ranging from $30.00 MXP to $75.00 MXP. Most of the plates here are between $65.00 MXP & $100.00 MXP. They serve sandwiches, hamburgers, pizza, pasta & salads. As always, the Planet Hollywood has lots of movie memorabilia including a life sized shot up Arnold from the Terminator. They also have several large TVs. If you pass by this Acapulco restaurat (and if there is an empty table) you really need to give it a try. They have some of the best Mexican food in town at very reasonable prices (which explains why it's almost always packed). They also have T-Bone Steak ($55.00 MXP), hamburgers ($15.00 MXP).